The Rev. Gardner C. Taylor prays during his sermon at a historic meeting of four black Baptist denominations at the Opryland Hotel in Nashville, Tenn., in 2005. Religion News Service file photo by Michael Clancy. It could not have happened on a more appropriate day. Gardner C. Taylor, a giant of the American pulpit who had spent most of his life proclaiming Christ, passed away on Easter Sunday at the age of 89. 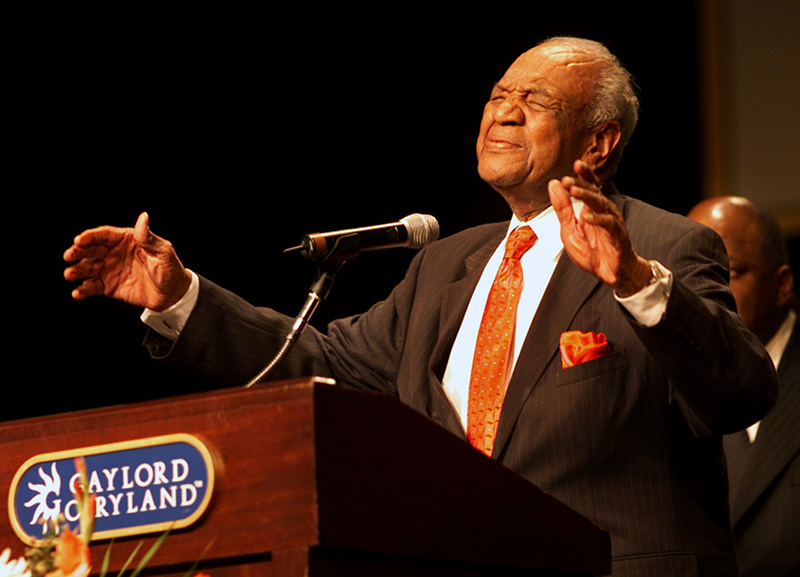 Taylor served from 1948 to 1990 as Senior Pastor of Brooklyn’s Concord Baptist Church of Christ. He was influential in the establishment of the Progressive National Baptist Convention, and served as President of that important body. He served twice as National Radio Preacher for NBC, delivered the 100th Lyman Beecher Lectures on Preaching at Yale University, and lectured at many colleges and seminaries. In 1979 Time magazine called him the “dean of the nation’s Black preachers,” and Baylor University included him in its 1996 list of the 12 most effective preachers in the English-speaking world. In 1993 I had my first opportunity to meet Dr. Taylor, conducting an interview that would appear in the January-February 1994 issue of Preaching magazine. He became a Contributing Editor of that publication (which I serve as Executive Editor), and spoke for us at the National Conference on Preaching and other events. Over the years I was blessed to have the opportunity to visit with him from time to time, and in 2010 was honored to be invited to write a chapter for Our Sufficiency Is of God, a book which consisted of essays written in honor of Dr. Taylor, edited by Timothy George, James Earl Massey and Robert Smith, Jr. My last personal visit with him was at the reception marking the release of the book, held at Duke Divinity School in order to accommodate his inability to travel (he was living in Raleigh, North Carolina in retirement). Even then, with his health on the decline, he was gracious, engaging, and exuberant in his love for preachers and preaching. 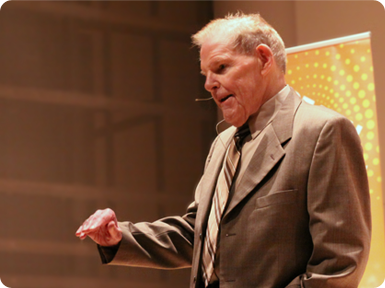 He was the final pulpiteer of his generation; we called him “the last pulpit prince” in a 2014 profile in Preaching. He not only faithfully preached the Word to his own congregation for many years, but he profoundly influenced more than one generation of preachers who stand on his broad shoulders. Even as he lays down his mantle and moves into the other side of eternity, may he inspire ever new generations of preachers to preach the Word boldly and faithfully. 1. Always be considering where the next hire needs to be. Aubrey Malphurs says the best time to hire someone is before you feel the need. What he means by that is that it is ideal to be able to play offense rather than defense – to be able to fill a spot before the situation becomes critical. When you can stay ahead of the curve, it means that you can take the time to look for the right person without being rushed, and that can help you avoid some mistakes. 2. Keep a file of potential future staff. As you run across promising candidates, keep their names and information in a file that you can pull out quickly in the event of an opening. 3. Have a written job description. Too often a staff member is hired and comes on board having heard one set of expectations for the position, only to find that those don’t match up with the reality. That creates a problem for both the church and the staff member. In a related thought, make extensive notes in the interview, and then do a follow-up document expressing the major thoughts expressed by both sides. Share it among the committee to be sure there is a consensus that this is really their view, then share it with the candidate. This can help a committee clarify what it is really looking for, and can help the candidate clearly see what the church’s expectations are. 4. Don’t assume you know them well after an interview. Some people are charming and smooth in an interview, but once you get them on the job you discover their primary skill is good interviews. Others may appear shy or less assertive, but you may find they are top workers once they are on board. The interview is helpful, but it is no replacement for talking to people who have worked with the candidate previously. Another suggestion: always have more than one person participating in an interview with a candidate. Sometimes the whole search committee will be involved, but if not, at least have someone else with you as you do the interview. They can help you observe the candidate, pick up on questionable areas, notice things you may have missed as you are engaged in the conversation. Some useful interview questions might be, “As a leader, how have you relied on others?” or “How do you compensate for your weaknesses?” (The question, “What are your weaknesses?” always elicits the clichéd response, “I just can’t seem to stop being such a perfectionist.”) Be careful – when someone projects only strength, there’s usually a hidden weakness.